We only use the highest quality lenses at Eye to Eye Optometry. If you are concerned about your lenses being thick, then we can provide you with the thinnest, lightest lenses available on the optical market. Grinding lenses to frame specifications is one way of achieving this. Using a stock lens will often give a thicker result, especially as the frame gets smaller. By specifically grinding to the frame you have chosen, the thickness is reduced dramatically. Your glasses will look better and the end result is lighter on your face. CR39, the basic lens material has a refractive index of 1.44. Lenses made from higher index materials can be cut thinner and hence lighter for the same prescription. High index lenses are available in a range of refractive indices from 1.53 to 1.74, with 1.74 giving the thinnest, lightest lenses possible. If you have a high prescription you will particularly benefit by choosing lenses made from a higher index material. The Eye to Eye team will assist you in selecting the appropriate index for your prescription. Our preferred coating is called Glacier Plus UV, developed by Shamir. Glacier Plus UV provides unsurpassed visual clarity by eliminating the four enemies of clear eyesight: glare, smudges, dust and scratches. Glacier Plus UV has a built in hard coating, and has hydrophobic and antistatic properties. Glacier Plus UV gives you optimised eyesight with better contrast during the day and enhanced visual comfort at night. Glacier Plus eliminates bothersome reflections that can appear on the surface of an uncoated or hardcoated lens. It is particularly advantageous under fluorescent lights, on computers and for night time activities especially driving. 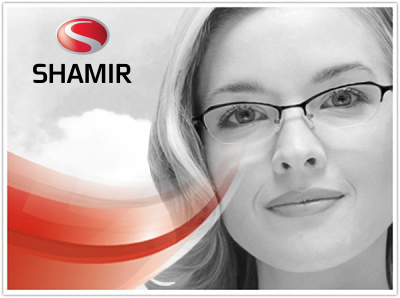 We also offer Shamir’s Glacier Blue Shield UV, which is an antireflective coating that deflects a significant amount of the blue wave length of light, often emitted by computer screens. This reduces eye strain and improves contrast when using devices, whilst still being a great option for everyday wear. We provide single vision lenses, all indices, all coatings, bifocals and the latest Progressive lens technology. Bifocals were the first ‘multi’ focus lenses produced. They have a visible line and are still the preferred option for some. We believe most people will benefit from the advantages of progressive lenses, having no lines and giving intermediate vision as well as distance and near, however we are still able to provide bifocals for those who prefer them. Progressive Lenses can now be custom made to give the least peripheral distortions and hence the widest visual field possible for your particular prescription, frame and facial measurements. Occupational Lenses are also available that cater for different work situations, for example for those who do a high proportion of computer or intermediate work but also need to glance into the distance. We carry a range of safety frames that can be fitted with your prescription and are provided with Safety Certification to meet health and safety requirements.